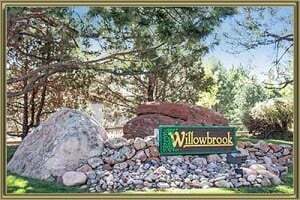 Willowbrook is a sought after community that feels like a secluded sanctuary near Red Rocks Country Club, located west of C-470 off West Belleview and Colorow Drive. The neighborhood was established in the early 60’s and homes have been added through 2000’s that offer a mixture of custom homes with floor plans ranging from 2,500-5,500 square feet with 2-3 car garages. The Willowbrook Homeowner’s Association has its own amphitheater, open space trails, playground/picnic area & stables. A multitude of private parks including an arena and horse trails are also available near the homes for sale in Willowbrook. With elevation around 6000 feet, it’s easy to enjoy extensive views of the city lights, mountains, red rock outcroppings, wildlife and nature from the spacious decks and walkout basements. Many homes in Willowbrook are situated on professionally landscaped 1-4 acre lots with some containing babbling brooks and ponds on their own private retreat. For added entertainment and golfing Red Rocks Amphitheater, Red Rocks Country Club, The Meadow Golf Course and Fox Hollow Golf Courseare only minutes away from homes in Willowbrook. For your everyday shopping needs Littleton and Southwest Plaza Mall is right around the corner, and for work and play the Tech Center, Foothills and paramount ski resorts is a brief commute. See what your home is worth With an Instant Home Valuation Online. Want advice on selling your house? We provide a free staging consultation, pre-listing prep plan, and a Willowbrook real estate market analysis. Call us at 303-325-5690 to learn more. New to the Area? Call our Willowbrook real estate agent at 303-325-5690 to schedule your tour of Homes in Morrison CO.